HELP!!!! This is New England in January and its going to SNOW!!!!!! It’s going to snow!!!!! Red alert!! Red alert!!! Duck and cover! Run right out and by a generator! Help, help, help!!! According to the Weather Channel and CNN, this will be a “historic storm”!!!!!! The sound you hear is me, screaming in fear! See, I’ve lived here my whole life. (I am beginning to wonder why, but that’s another post for another day.) When I was a kid, we used to have really big snowstorms all the time. I remember piles of snow that were big enough to build those awesome tunnels and caves through the snow mounds. 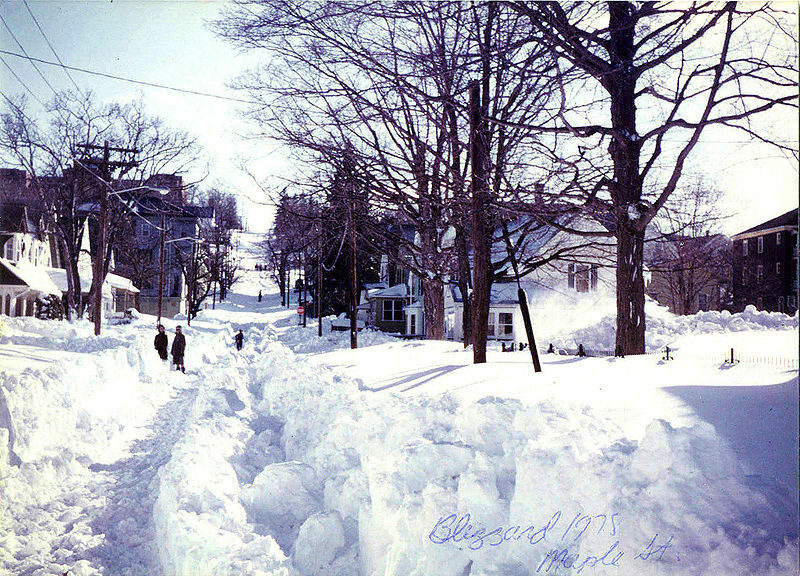 I remember snow so deep that we’d sled down the piles that were made in front of our house. OK, so granted I was only about 4 feet high at the time, but still. When we moved out here to this house in Central Mass, around 25 years ago, we didn’t even call the plow guy to clear the driveway if there was less than 7 inches of snow. This week, though, the TV guys referred to an upcoming storm as “the first major storm of the season”. Everyone got all hyped up. They ran out for bread and milk. The news guys predicted power outages, wet, heavy snow, downed power lines, black ice, you name it. We got about 6 inches of lovely fluffy snow that drifted down gently all day. That used to be “a nice day” in January. Now it gets its own “Breaking News” coverage. So tonight I am highly skeptical. You see, the local news, New England Cable News, the Weather Channel and CNN are all breathlessly warning “millions” of Americans about the “historic” storm that is coming to slam us. It even has a name: Winter Storm Juno. Maybe I’d be more impressed if they had sense enough to give the big storms scarier names. Like “Bruno” or “Amazonia”. But “Juno”? I ain’t scared. Meanwhile, with the entire New England region completely shut down, everyone will start texting each other about Tom Brady’s balls (sorry, couldn’t resist). And we’ll get ten inches of snow. Max. I’m not buying the hype. Nuh, uh. No way. It was, of course, the famous “Blizzard of ’78”. I got home four days later. Happy Snowstorm, my friends! My your beer last as long as your Monopoly game! On a less humorous note — it sounds like we live in the same area. As far as I can tell, we are on the edge of the wind and a STORM OF BIBLICAL PROPORTIONS zone. We, being down in Uxbridge, actually didn’t get hit by Hurricane Sandy, but it isn’t unusual for us to get buried when everyone else gets flurries. This looks to be a primarily coastal storm. it’s pretty big, so this being central Mass, we’ll get some snow, but it is not the end of the world. I’m more worry about wind and losing power because we don’t have a generator. When the power goes out, we don’t have water or heat or much of anything. National Grid are a bunch of morons and think we can report outages on their website. What is it about “power outage” that eludes their understanding? I’m hoping we’ll just get a regular old fashioned snowstorm. Inconvenient, annoying, slippery, and gee I really hoped we might get through this winter unscathed. But hey, it’s almost the end of January and we haven’t had a snow worthy of the name, so I figure we are ahead of the game. That I’m going to have to reschedule a doctor’s appointment and a dentist appointment is more annoying, but I can live with it. As you say, it’s January and this is New England. Not like we aren’t used to snow. Remind me why we live here. Because this is the time of year where I have trouble remembering. Oy, I know, and it snowed here in NYC, but it was so bad because it rained right after and warmed up…but people are already bunkering down for Tuesday. I know I sound like that old cliche, “I used to walk 20 miles to school”, but jeez, the hysteria about this snowstorm is insane! The first winter that we lived here, we got a storm of 34 inches, and no one batted an eye. I just heard from Harvey Leonard … old colleague of Garry’s. He says we will get at least a foot, hopefully not more than 2. The worst of it will be along the shore. But we will get hit. Not the storm of the century, but bad enough. I know Harvey well! Used to watch him all the time. If he says snow, I believe it. Just wish we didn’t have to name the storms or fly into a panic! A foot, even 18 inches, isn’t that big a deal! Glad my husband dragged me to CA 32 years ago. Naming storms is stupid. But picking “JUNO” is absolutely ridiculous. I mean, JUN does not make me think snow. Good luck with the storm. Hope it is hyped more than needed. But that you are warm and cozy and have some wine on hand!